By absolute luck at being in the right place at the right time, I found myself facing a shelf of enticing product design having been drawn in by the styling. Once I read further on the placard displayed next to the row of classily-packaged chocolate bars and boxes, I realized that I was in the presence of a unique opportunity. I hadn't seen any other buzz about it and considering its exclusivity, I made an instant decision to buy a 4.2 oz box of 20 small tasting squares for a whopping $30 at ChocXO's newest outpost in Irvine. 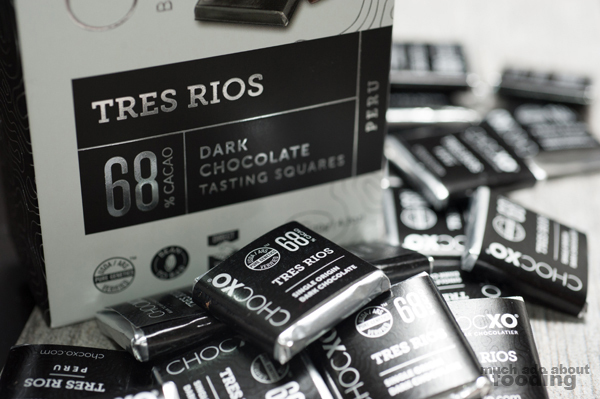 The enticing foil patterning on the sleek black and white bars and boxes is attractive but even more so is the story of how "Tres Rios" came to be. Let's just say that your only chance to try out this rarity is at ChocXO and only before the limited edition boxes sell out. 500 bars and 500 boxes are available, and we have one of those. How many more will be left when you want your taste? "We believe in the quality of the bean above all else." 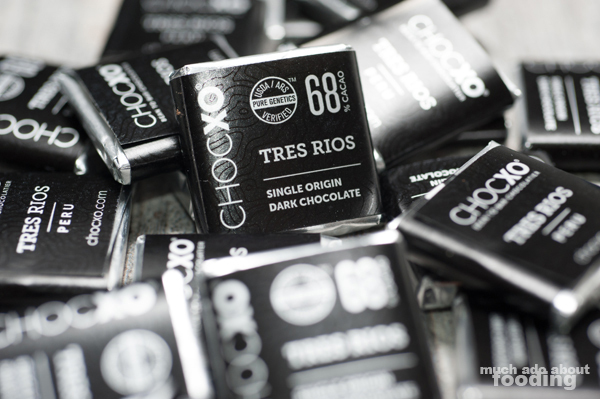 ChocXO (pronounced choc-zo) is known in southern California for both chocolate and coffee. A bean-to-bar chocolatier and a coffee roaster, the establishment has locations in Costa Mesa and Lake Forest as well as a factory in Irvine. 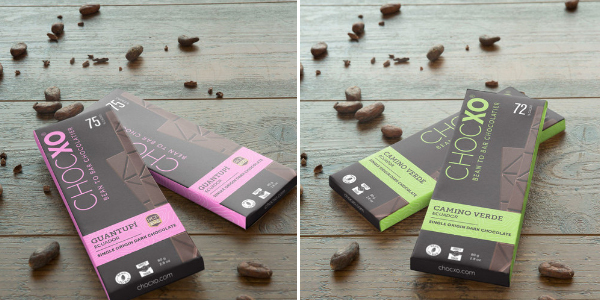 Created by Richard Foley, a Dana Point resident with 30+ years of chocolate industry experience, ChocXO was built upon the dream of using the best of everything from ingredient to process to product. 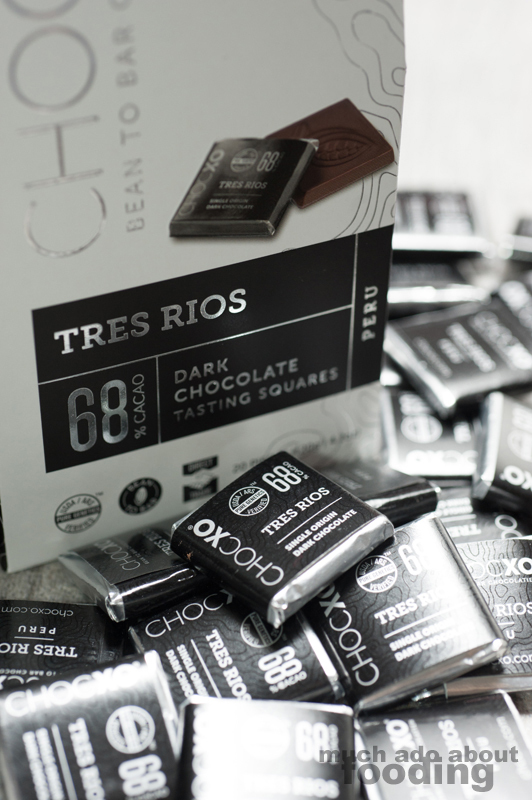 Their proud claim on sourcing is that they only purchase the top 10-15% of cacao beans in the world (usually from Central and South America) which is then turned into chocolate right in the first and only bean-to-bar chocolate factory in southern California. It was there in Irvine that I found the Tres Rios and made sure that I got box #42 (hope you get the reference!). We'll have to get a few tastes of those ourselves another day. They are all available at the factory and both cafe locations as well. In addition to retail products, Irvine's location allows visitors to learn about the chocolate-making process from the raw cacao beans to the end chocolate through guided tours and Chocolate Labs. One can also indulge in liquid chocolate shots and find more than just bars; there are truffles, bark, bonbons, chocolate-covered Oreos, hot chocolate mixes, and even chocolate-covered espresso beans (one of my favorites). 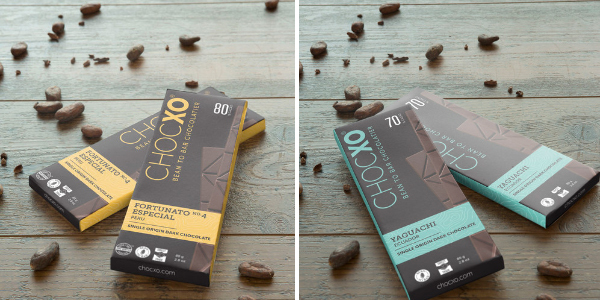 "Discovered by Noé Vasquez, a native farmer of the Marañón anyon, this unprecedented cacao is a perfect cross of pure Criollo and Nacional. The unique trees yield much larger than average beans with half of them being all white. 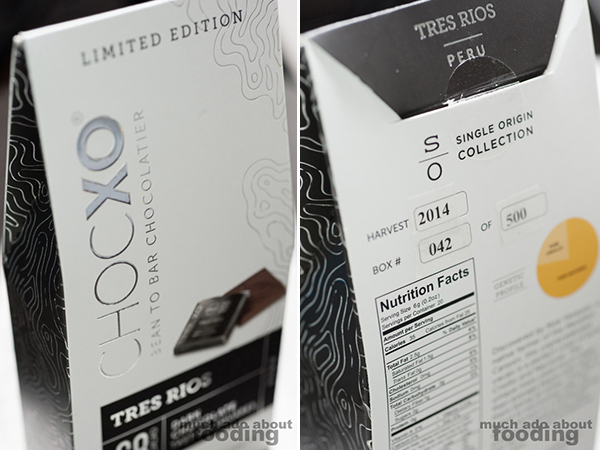 ChocXO is proud to exclusively offer the entire harvest in a limited special production yielding less than 500 lbs of rare and exceptional chocolate." So the exclusivity makes it a catch but beyond that, so does the type of bean. Criollo is considered the most prized among varietals of cacao, and the rare white appearance this particular bean and inclusion is coveted as most of the beans themselves are brown. The plants themselves the least resistant to disease which leads to low production numbers, and its inherent trait of containing less of the bitter anthocyanins creates a mellower, more palatable chocolate. 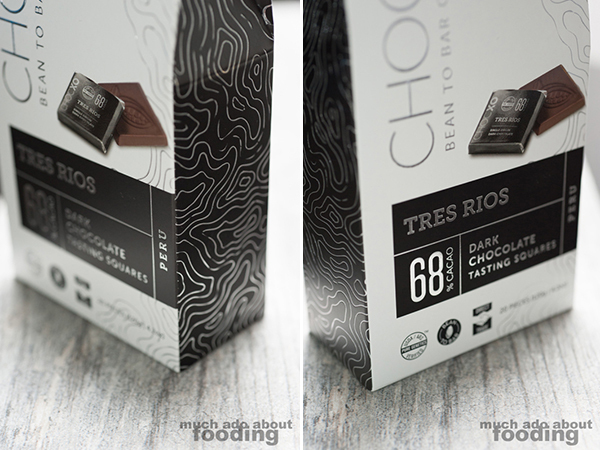 What started out as a mutation of beans from untouched Nacional trees has created a desirable bean that churns an expensive product; you can't find 100% Criollo chocolate. Called “Manjar de los Dioses,” or God’s Nectar, in Peru, the beans contain cacao butter percentages of 50-60% which makes for a rich, creamy chocolate. Considering all of this, you can see why Tres Rios is something quite special now. ChocXO purchased the entire 2014 harvest from the grower of these Criollo/Nacional beans! We tried a bit from the box already and did so before looking up the exact reasons why it was so special, just so our opinions wouldn't be swayed. Tasting it properly was a technique we learned from Valenza Chocolatier's Chocolate Tasting 101 workshop a few months back so we proceeded to inspect and listen to our chocolate before having some. We first broke the chocolate and the clean, crisp snap was immediately a good sign. Inspecting the pieces showed no inconsistencies, and soon, the body temperature from our mouths worked its way to melting the pieces down. I got some notes of currant and cherry before sensing subtle nuttiness and a toasted scent. What we both recognized right off the bat though was that there was hardly any bitterness in this 68% (and later learned why). There was not a lingering acidic sensation at the end either which can be common in chocolate; it just all melted away cleanly after the flavors had their time in the spotlight. I'll be making sure to savor every last tasting square I can! The question on if it is worth your hard-earned dollars though is a matter of priority; what spot in your life does chocolate hold? Photography by Duc Duong unless otherwise noted. More photos available on Facebook here.